Thank you to everyone who joined us on December 15 for the Inaugural LETR Unified Flag Football Tournament! 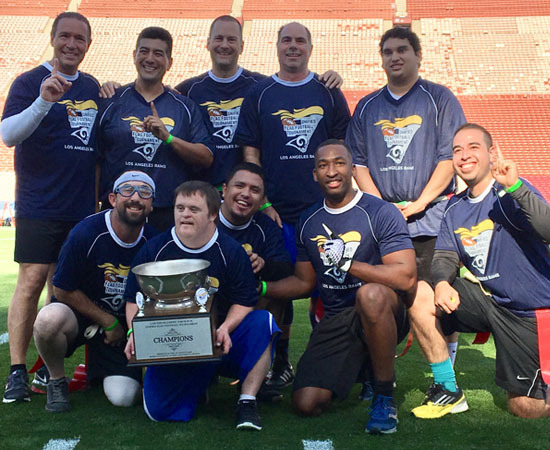 This round robin style tournament featured 16 teams of 10 players comprised of five Law Enforcement Officers and five Special Olympics Athletes. Plus, the top two teams from the tournament played in the championship game at the Coliseum prior to the Rams/Eagles game on December 16! Are you interested in future LETR Unified events? Fill out our interest form to stay updated! Congratulations to the Championship Team, the LAPD Operations West Bureau Badgers, who received face time on the big screen and lit the Coliseum Caldron Torch prior to 12/16 game!